KIEV, Ukraine -- Ousted Ukrainian president Viktor Yanukovych has controversially spoken out from self-imposed exile in Russia, promising, exactly a year after he fled Kiev, to return to Ukraine to “ease people’s lives” and help stop the war. “I regret that I was unable to do anything,” Yanukovych said. In the year since he fled, Russian president Vladimir Putin has annexed Crimea, Russia-backed rebels have established breakaway republics in eastern Ukraine, and at least 5,700 people have died in the conflict. 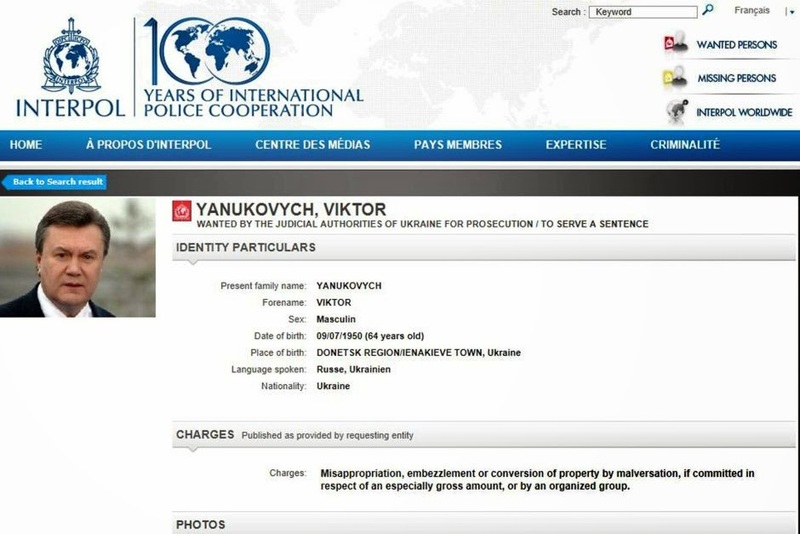 Yanukovych is despised across much of Ukraine, viewed as a corrupt Russian puppet by the pro-western protesters that forced him from office, and as a coward in the pro-Russia east. As he spoke, a fragile peace plan remained in the balance, with a prisoner exchange proceeding on Saturday amid continued shelling. Meanwhile thousands assembled in Moscow for an “anti-Maidan rally”. Rows of buses parked nearby and the rapid departure of attenders after the rally raised suspicions that hired protesters had been brought in from other regions, a common tactic at pro-Kremlin rallies. In Kiev, Petro Poroshenko, the oligarch who publicly backed the Euro Maidan protests last winter and was elected president in May, blamed Russia for inciting conflict at an anniversary vigil in memory of more than 100 demonstrators killed at the height of the unrest. Commemorations continued on Saturday with a display by the defence ministry of grenade-launchers, drones and other weaponry seized in eastern Ukraine, which it claimed was from Russia. Rebels are believed to receive weapons and supplies from Moscow; the conflict is estimated to use up to 150 tonnes of ammunition a day. Fighting has continued in eastern Ukraine despite a peace plan agreed last week in Minsk by the leaders of France, Germany, Russia and Ukraine. The plan was for a ceasefire followed by a withdrawal of heavy weapons and an “all-for-all” prisoner exchange, but none of these steps was fully achieved. Despite the ceasefire, rebels forced Ukrainian troops to retreat from the strategic town of Debaltseve on Wednesday and Thursday after weeks of intense fighting. And on Friday several rebels in Debaltseve told the Observer they wanted to go on to take the rest of the Luhansk and Donetsk regions, but accused Kiev of violating the ceasefire. Shelling has continued along the frontline: I heard artillery and rocket fire outside Debaltseve on Friday, and volleys from rocket launcher systems near Donetsk early on Saturday morning. Rebels fired Grad rockets, one of this war’s most fearsome weapons, at the villages of Stepne and Vodyane near Donetsk, the Ukrainian military said. And regional police chief Vyacheslav Abroskin said a shell hit a cafe in the town of Avdeyevka, killing three. The Donetsk administration said a tea factory, a block of flats and a kindergarten in the city had been damaged by shelling overnight. The taking of Debaltseve and continued fighting nearby have raised concern that rebels could attempt to take the town of Schastya, which is home to a power plant and was for a time controlled by Luhansk separatists, or the coastal industrial centre of Mariupol. Ukrainian military spokesman Colonel Andriy Lysenko said on Saturday that Kiev was braced for an attack on Mariupol, and accused Russia of supplying tanks, troops and missile systems to the area. Tank and artillery battles have raged over the past two weeks near Mariupol after Ukrainian troops began what Poroshenko called a “counter-offensive” to take the village of Shirokyne. According to Kiev-based military analyst Alexei Melnik, the move was meant to push rebel artillery out of range of the city after an attack in January killed 30. At 3am on Saturday, rebel forces conducted large reconnaissance raids on Shirokyne, spokesman Anatoly Stelmakh said. The organisation Defence of Mariupol later said on its Facebook page that one Ukrainian soldier had been killed and another wounded in Shirokyne after rebels fired mortars and grenades. Local activist Halina Odnoroh said that last weekend she and others had evacuated more than 1,000 residents from Shirokyne, which has been significantly damaged by shelling, and is not firmly under control of either side. Many in Mariupol, which was briefly under rebel control last May, fear it could face a pro-Russia offensive. Odnoroh admitted that a significant portion of the population remains pro-Russia. “We’re getting ready to hold more rallies, mobilise people and show that Mariupol is a Ukrainian city,” she told the Observer. According to Melnik, Russian military forces are working with rebels in the town of Novoazovsk, which lies between Mariupol and the Russian border. He said he saw many parallels between Debaltseve and the coastal city. “If it is decided in the Kremlin to seize Mariupol, then Kiev will once again face a tough choice, to risk huge casualties and infrastructure damage, or yet again retreat from an area it controls,” he said.